106 – The top half of the bracket features one of my “first round matches to watch” with #5 Dillon Gottschalk taking on #6 Evan Yant. The winner will most likely see #2 Ben Monroe (Ankeny Centennial) in the semis. Monroe and Gottschalk meet earlier in the year with Ben taking the 7-2 victory. The bottom half of the bracket features four ranked wrestlers led by undefeated freshmen #1 Cullan Schriever (Mason City). Schriever comes in with only 25 matches on the year, but has beat Monroe and #3 Nick Oldham (Valley, WDM) twice. Oldham/Schriever should be a great quarterfinal to watch on Friday morning. #4 Conrad Braswell (Prairie, CR) is the favorite to emerge from the bottom quarter. 113 – Talk about loaded, the top half of this bracket features #1 Drew Bennett, who looks to have a clear path to the semis. In the other quarter on this side you have a first round battle between #2 Kyle Biscoglia (Waukee) and #5 Jacob Close (Epworth, WD), winner likely meets #3 Kobey Pritchard (Indianola). Biscoglia owns a win by fall over Pritchard, while Bennett holds to razor thin victories over Biscoglia. #4 Jacob Schipper looks to be the cream of the crop in the lower half of the bracket. In the bottom quarter #10 Jakey Penrith (Cedar Falls) comes in fresh off an upset victory over #5 Close at districts, he will look to keep the momentum going in his first round battle with UR Carter Logue (Carlisle). #7 Eric Owens (Ankeny Centennial) who battled through the toughest district in 3A at this weight to qualify, should see the winner of Penrith/Logue for a spot in the semis. 120 – Eight ranked wrestlers in total made the state tournament at this weight, three reside on this side of the bracket led by #2 Gauge Perrien. Gauge got a late start to the season but has been rock solid in the SEP lineup since his return. Looking forward to a possible matchup between #4 Dylan Albrecht (Waverly-Shell Rock) and Perrien in the semis Friday afternoon. Bottom half of the bracket contains the #1, #3, #5, #6 and #7 wrestlers in the state. Another first round match to watch here between #5 Hughes-Reilly (Valley, WDM) and #7 Connor Sexton (Indianola), winner likely sees #3 Joe Pins (Dubuque Hempstead). 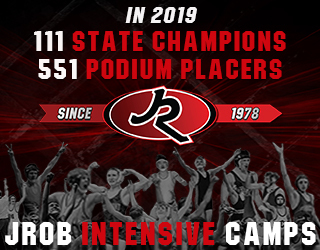 Two-time undefeated state champion #1 Brody Teske (Fort Dodge) is the favorite in the other quarter. 126 – Three-time state place-winner #2 McGwire Midkiff (CBTJ) headlines the top half of the bracket he will likely meet #5 Spencer Hutchinson (Valley, WDM) in the quarters. #4 Will Foreman (CR Washington) and #6 Damond Lockner (Fort Dodge) meet in a first round match to watch, winner gets a shot at either #9 Brydon Hervol (Waverly-Shell Rock) or district champ Lucas Harmening (Prairie, CR). Bottom half of the bracket features three CIML conference ranked wrestlers, #1 Adam Brown (Southeast Polk) also a three-time state place-winner, has not taken an in-state loss this year and owns wins over #2 and #3 in class 3A. #3 Zach Price (Johnston) is the only ranked wrestler in his quarter of the bracket. Brown/Price semi should be a good one, although Brown did widen the gap last time out winning 10-2 at CIML’s. 132 – Top half of the bracket features both #1 Cade DeVos (Southeast Polk) and #2 Jake Watters (Dowling Catholic) in separate quarters. Standing in Watters way is a first round matchup with #7 Joey Harney (Iowa City High) and a likely quarter-final match with #6 Will Jefferson (Bettendorf). DeVos and Watters have met 3 times this year with DeVos holding a 2-1 advantage, winning the last two. This half of the bracket has five ranked wrestlers and is highlighted by a potential quarter-final bout between #3 Bradan Birt (Epworth, WD) and #4 Lance Runyon (Indianola). #5 Trenten Wennermark (Prairie, CR) and #10 Matthew Jordan (DM East) meet in a first round match to watch. #9 Zach Main (CR Jefferson) and UR Mayson Shannon (North Scott) is another good one to keep an eye on. 138 – We will see a unranked wrestler in the semis for sure at this weight as the top quarter is wide open. #2 Nathan Lendt (Southeast Polk) and #3 Collin Lewis (North Scott) is my pick to meet in the bottom quarter Friday morning. Winner of that match should be the favorite to make the finals. The bottom half of the bracket is packed with ranked wrestlers but one stands out for sure, #1 Triston Lara (Fort Dodge). The defending state champion and UNI commit has one out of class hiccup this year, other than that he has been a hammer in the Dodger lineup. Look for him to face the winner of #5 Gabe Kjeldgaard (Lewis Central) and #7 Nathan Fledman (Dubuque Hempstead). In the bottom quarter of the bracket #4 Harlan Steffensmeier (Fort Madison) and #8 Bryce Murano (Dallas Center-Grimes) meet in round one. #6 Mason Morris (Bettendorf) likely awaits in the quarters. Bottom half of the bracket contains a must watch first round match between defending state champ #2 Grant Stotts (Valley, WDM) and #5 Josh Gerke (Xaiver, CR), these two have not met this year. In the last quarter #3 Nick Graham (Johnston) is back from injury and should see #8 Trevor Anderson (Glenwood). 152 – #6 Colin Conway (Marion) comes into state having won the toughest district at this weight, he will likely face the winner of Lewis Central’s Caleb Kingery and #7 Joe Nicholson (Valley, West Des Moines). The bottom quarter should feature a matchup of two juniors, #2 Cayd Lara (Fort Dodge) and #8 Zane Mulder (Dallas Center-Grimes). Five ranked wrestlers are on the bottom side of the bracket, led by returning state champion #1 Nelson Brands (Iowa City West). Brands and #10 Shawn Brown (DM Lincoln) is the match I expect in the bottom quarter. #3 Austin Yant (Waverly-Shell Rock) and #4 Alex Ward (Dubuque Hempstead) should be a great first round match. Waukee sophomore #9 Anthony Zach has had a solid up a couple weights from last and should see the Yant/Ward winner. 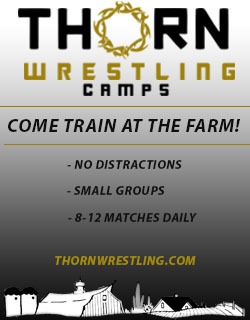 160 – This is the only weight class I had all ten ranked wrestlers qualify. #1 Joel Shapiro (Valley, West Des Moines) has been a hammer all year and will be looking to cap off his junior season with a state title. Shapiro’s quarter-final opponent will be the winner of #6 Tad Griffith (DM Lincoln) and #8 Alex Streicher (Linn-Mar). #10 Collin Hushagen (Johnston) and #5 Carter Rohweder (Iowa City West) should meet in the top quarter. #7 Tyger Whitters (Prairie, CR) will be looking to rebound from a district finals setback to Rohweder when he takes on Ryan Loyd (Pleasant Valley), winner meets #2 Mac Southard (Lewis Central) in the top quarter. #4 Matt Culver (CR Jefferson) and #9 Thad Breitsprecker (Southeast Polk) meet in an intriguing rematch from the Red Owens tournament earlier this year, Culver won that one 12-9. #3 Zach Waggenhoffer (Waverly-Shell Rock) likely awaits the Culver/Breitsprecker winner. 170 – #3 Tavian Rashed (CR Jefferson) and #4 Austin Lamm (Urbandale) both lost their district finals matches, both are the favorite in their first round match. Lamm meets #5 Babcock (Southeast Polk) in a first round match to watch, while Rashed takes on #8 Jason Beebe (Oskaloosa). Cedar Fall’s senior #7 Bryce Pilcher is the lone ranked wrestler in the top quarter. Two-time defending state champion #1 Marcus Coleman will look to add to his collection before moving down the road to ISU next year. Standing in his way is a likely rematch from the Jack Mendenhall Finals with #2 Ben Sarasin (CR Kennedy), Coleman was the victor on that day 8-7. Travis Johnston (Carlisle) and #6 Kade Kolarik meet up in the first round, Kolarik won their previous 9-6. 182 – #2 Anthony Sherry (Glenwood) is the only ranked wrestler in his quarter. #7 Brock Hunger (Iowa City High) got a tough draw in #4 Tyrell Gordon (Waterloo East) winner here likely meets #5 Garrett Kubovec (CR Kennedy). Gordon holds a win by fall over Kubovec, while Kubovec defeated Hunger by fall in the MVC semis. The path is clear for #1 Max Lyon (Epworth, WD) to make the semis, he is the only ranked wrestler in his quarter of the bracket. Lyon has been a pinning machine all year. #10 Gabe Christenson (Southeast Polk) and #3 Spencer Sherwood (Burlington) should tangle in the bottom quarter of the bracket, for a shot at Lyon. 195 – A ranked matchup between #8 Sam Serrano (Davenport Central) and #10 Sam Pape (CR Kennedy) kicks off the top side of the bracket. UW Lacrosse commit #1 Kaden Sauer (Dowling Catholic) likely awaits in the quarters. 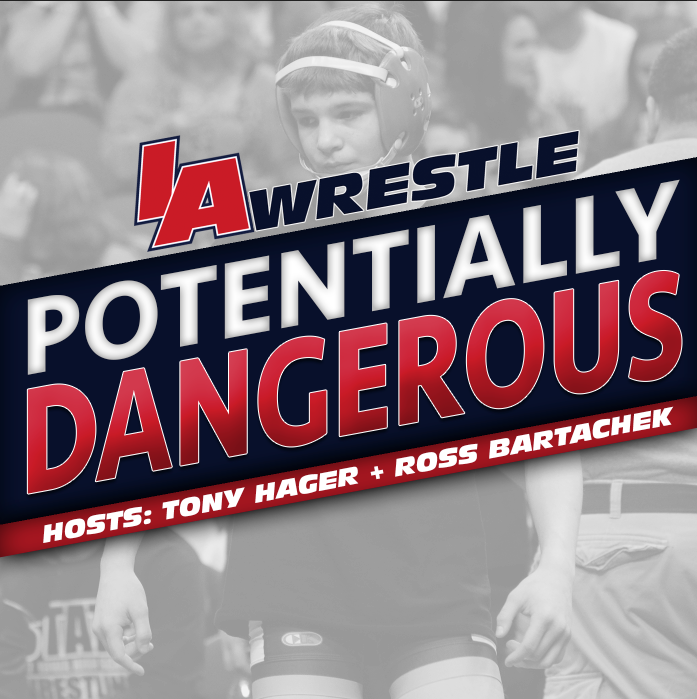 #6 Cody Wonderlich (Southeast Polk) has really developed over the year and should tangle with #7 Isaac Bales in a rematch of the 3rd place match at Ed Winger in January. Wonderlich won that match by fall. The bottom half of the brackets has the #2, #3, #4 and #9 wrestlers in class 3A. 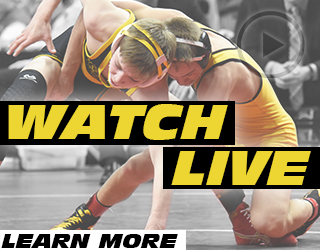 #4 Jacob Dykes (Iowa City High) and #3 Connor Corbin (Valley, WDM) meet in a first round match to watch. Brayden Schultz (Linn-Mar) and #9 Zach Peterson (North Scott) meet in another good first round match. #2 Isaac Bartel (Mason City) should advance to the semis out of the bottom quarter. 220 – Each first round match in the top half of the bracket features one ranked wrestler, if they all advance we will see some good quarter-finals. #1 Rocky Lombardi (Valley, WDM) is a pinning machine and should face #6 Dylan Olson (Dubuque Hempstead) to reach the semis. #10 Drake Leek (Norwalk) has been flying under the radar all year, will this be his time to breakout? He likely meets #5 Sam Gerst (Waterloo West) in the bottom quarter. #2 Wyatt Wriedt (North Scott) and #4 Jacob Eggleston (Waverly-Shell Rock) first round bout headlines the bottom half of the bracket. #7 Jordain Buckland (Iowa City High) should be waiting for the winner in the quarters. Top quarter favorite is #3 Zach Haggstrom (Glenwood). 285 – Time for the big boys, #3 Eagan Lickiss (Indianola) and #5 Omar Begic(Waterloo East) is a first round match to watch, winner probably sees Jack Roussel (Dubuque Hempstead) in the top quarter. #10 Jake Ryan (Johnston) and #4 Keegan Poole are expected to meet in the other quarter on this half. The #1 and #2 wrestlers in 3A reside on this side of the bracket. #2 Caleb Sanders (Glenwood) is making a return trip to the state tournament this time in 3A he meets #7 Callen Tomlin (Oksaloosa) in round one. Hawkeye commit and #1 ranked Aaron Costello (Epworth, WD) will be looking to make a return trip to the finals in his senior campaign, standing in his way is a quarter-final matchup with #8 Nathan McDonald (Waukee). February 14, 2017 in 2017 State Tournament Coverage, 3A.